The cleanup after the tornado that struck the Erie County Fairgrounds was well under way Thursday afternoon when an aide to Gov. 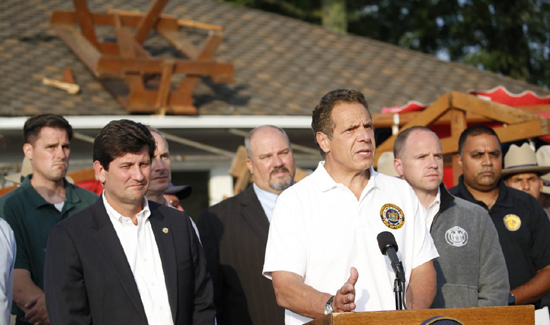 Andrew M. Cuomo asked that the cleanup be delayed – until after the governor arrived, fair CEO Dennis Lang said. Lang said he did not know the name of the man who asked for a delay. “After the ceremonial service was over, I haven’t seen any of them, nor do I expect to see any tomorrow and the day after tomorrow,” Lang said of state officials and National Guard, who were at the governor’s news conference. Cuomo’s office denied it requested the cleanup be delayed. She further added that the National Guard arrived and worked on cleanup before, during and after the governor arrived. She said the governor’s arrival in Hamburg was delayed because of extreme weather. But this isn’t the first time something like this has happened. In late August 2011, Tropical Storm Irene smashed into areas of upstate, damaging hundreds of homes, wiping out farms and gutting downtown areas of tiny villages in many eastern parts of New York. In the tiny Catskills community of Prattsville, one of the epicenters of the storm’s damage, work was halted on clean-up and repair efforts as volunteers, utility crews and homeowners were asked to prepare for Cuomo’s arrival.